They pick commodities in huge quantities = which naturally means a good price for the consumer. 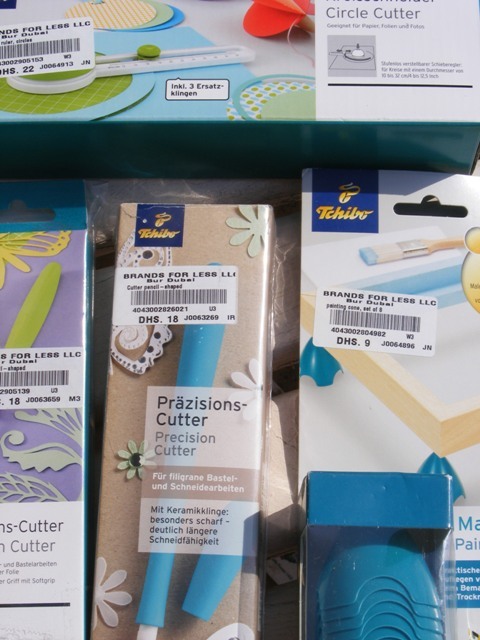 They have these special sales of 10 and 20 dhs prices, ( once or twice a year) on household/domestic purpose items which come in handy for us crafters. Buy Christmas ornaments after New Years ! Why you ask ? Prices ofcourse !! 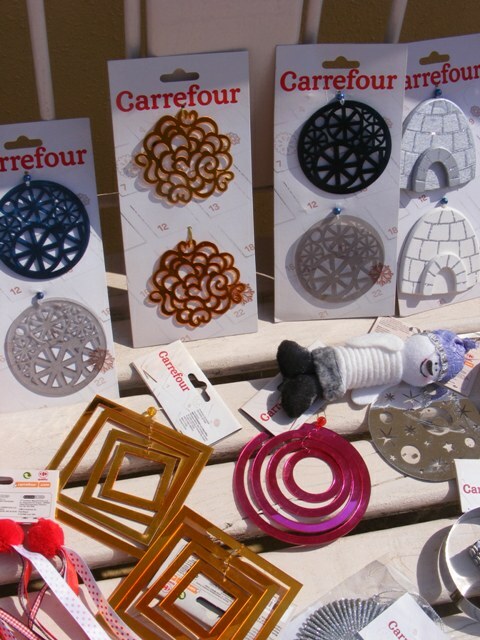 There are many such things that are helpful and available at Carrefour – Do you have them ? The twine is excellent and, I’ve realized at times, when your looking for them ~ you cant find them. 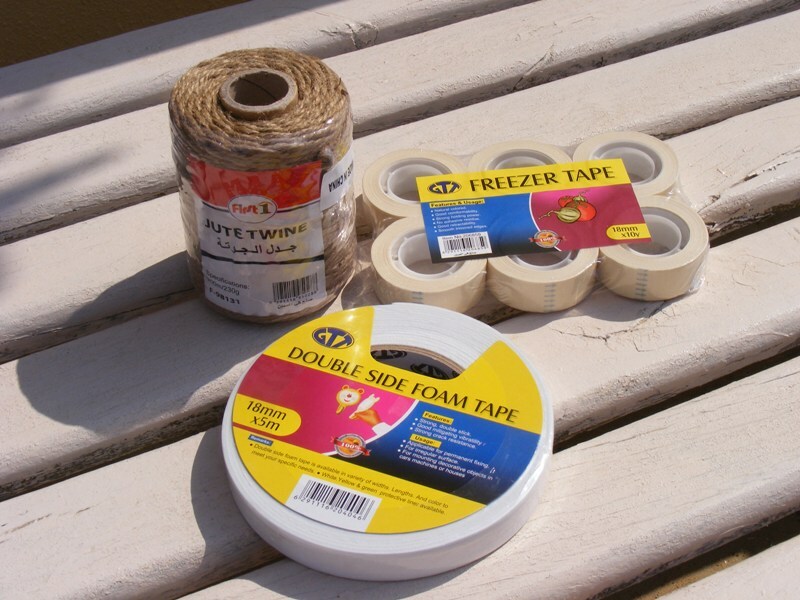 The freezer tape is going to be a great help, for my students, in the next art class. While we are Muslims and do not celebrate Christmas, I generally pick scores and scores of Christmas ornaments during the Christmas season. Why ? 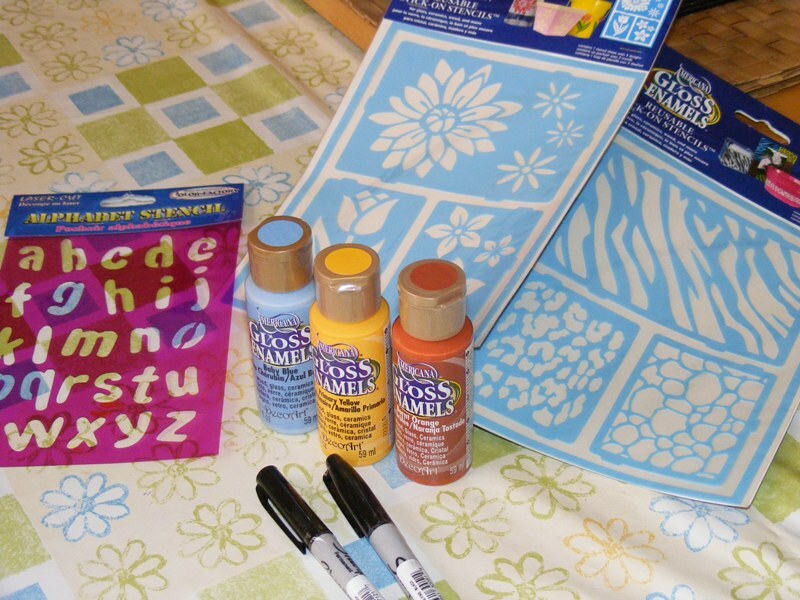 I can use them as templates and stencils. I can also teach my students how to make them, hence they are inspirational pieces. Some can be used as napkin rings. Some as curtain decoration or tie backs. 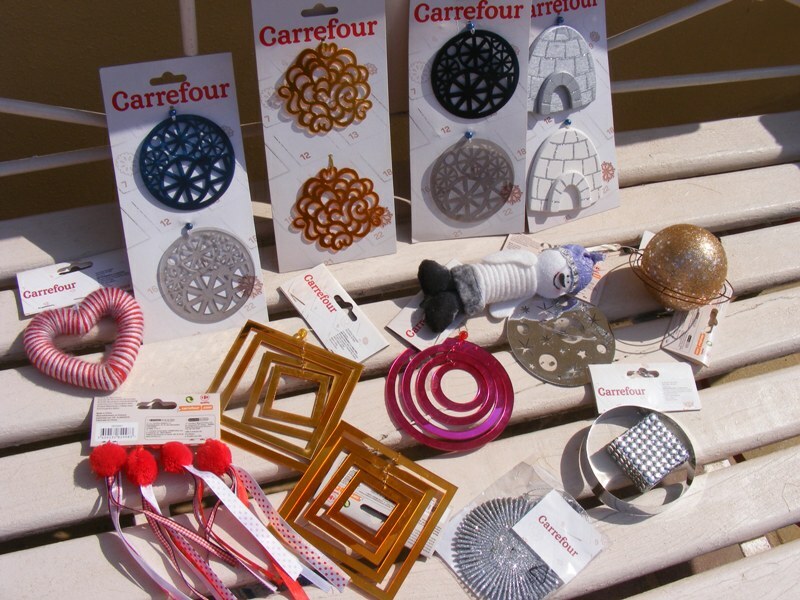 The next time your at Carrefour at Christmas time, think about the above possibilities while looking around for those ornaments. Daiso is a Japanese retailer who have been in the market selling Japanese products for over a decade now. They host stores in Ajman, Dubai ~ Mirdiff City Center, Lamcy Plaza and else where. You may have to look them up for a location closer to where you stay. I love the store in Ajman coz they are probably the largest with a larger variety. Their prices were very reasonable, as in Dhs 5 for most products. However over the years they have raised it to dhs 7 for most items. 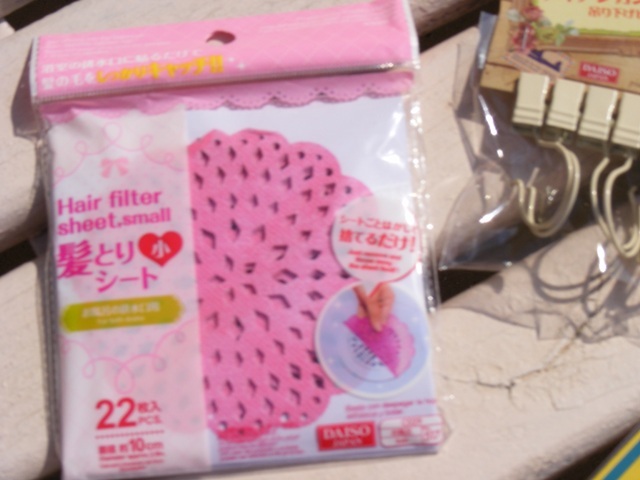 The below items were bought from Daiso. The hair filter can act as a stencil and with the excellent texture ~ it could be used in several other ways too. Ikea has a similar curtain clip too but without the loop. These files are hard to find. They are designed for smaller objects and I know exactly which wooden pieces are going to have smooth corners and surfaces now !! Yes, I know, your surprised ! I was too ! On one shopping trip with my relatives, while they shopped for clothes, I turned to the stationery shelves and was delighted to come across these lovely finds. Who would have thought that Brands for Less would carry these items too ! These two precision cutters are great too. I would use them only for fine tuning if my dies missed out some tiny corners. I have been visiting them on Sheikh Zayed Road branch and Murraqabat road branch for alittle over 7 years now and I must tell you, they’ve never disappointed. My manual paper cutter/the guillotine is also bought from there. I had shopped at their Al Warqa outlet and was slightly disappointed that they did not carry paint brands Folkart or American Crafts. They are not inexpensive but then professional art materials are seldom inexpensive. The medium gel is great to seal art works. The plastic spatulas may not have been my best buy ~ I wish they had the steel ones. On our way back from Jumeirah, we decided to pop over for a “short” visit to this store and I was totally taken aback, once I entered the doors ! Now this is what you call a crafters paradise. I don’t think, I could emphasis just how huge the store is, how well organized and well-kept their creative tools, supplies and variety is, so its surely a “must-visit” stop for any scrapbooker, crafter, hobbyist !! They have EVERYTHING you can dream of and more !! Nearly 10 years back when there were merely a handful of stores that carried specific products like rubber stamps for school teachers or charts for school, this store at the Beach center (ground floor) used to carry them. I think, they were called Al wasit trading then. They were quite expensive but the owner had once told me that they bought all their goods from USA directly hence it was that expensive. I am happy to say, that the owner has opened another store which is Creative Minds ! They have a huge collection of Sharpies too. The only draw back I noticed, are the prices. I feel, they are quite expensive but I suppose if money is not an issue, then this is one shop that has every hobbyist’s dream tools under one roof. Although, I had just bought myself a huge load of goodies from DLD just a week back, wouldn’t it seem rather rude, leaving without any purchases, at all ? 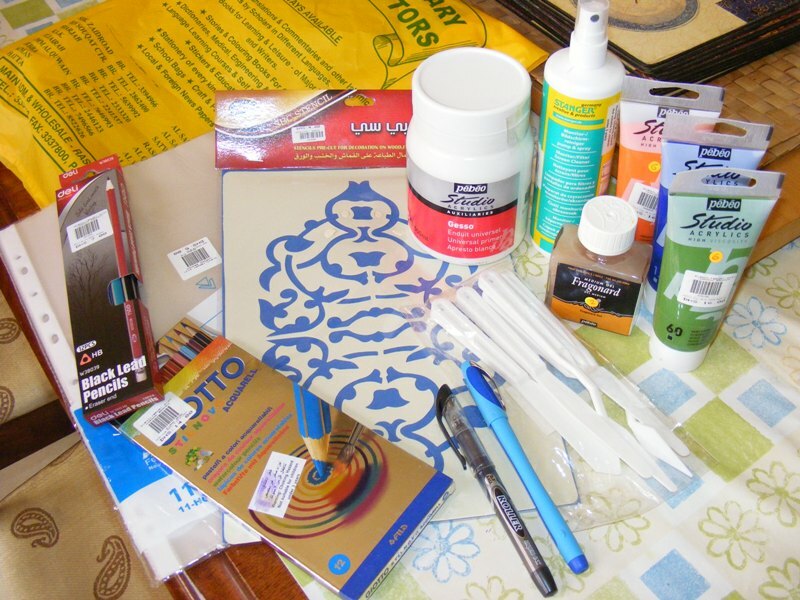 Oh of course it would, so I picked only a few paints, stencils, and sharpies (can never have enough of them). There are several problems associated with visiting and shopping at Sharjah city or outskirts. Most stores are wholesalers and don’t even want to entertain retail-customers. Most of these stores are haberdashery so in essence they cater to the needs of tailors, people related to the textile field etc and not crafters. 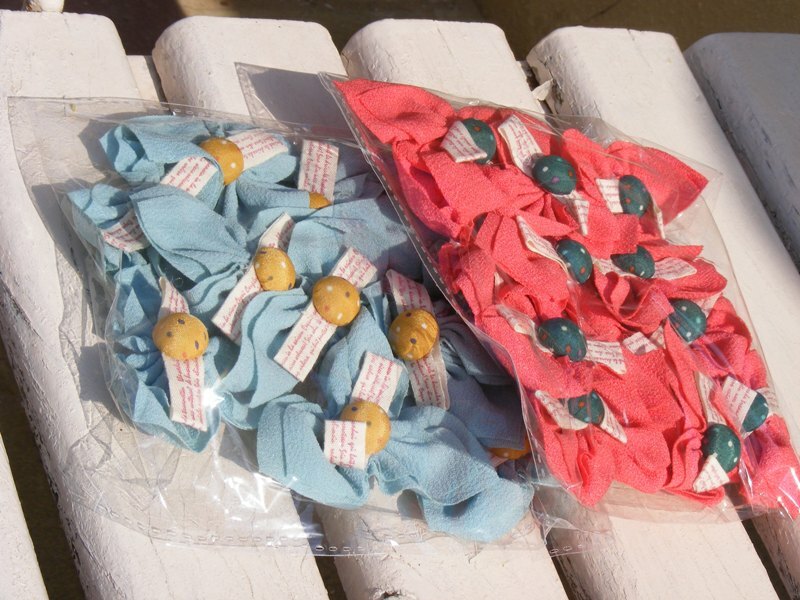 And Finally this huge treasure of beads, buttons, bows, embellishments was bought from the Malaysia !! How cool is that ! Voila !! There you have it. Some stores, you probably were aware of and some, you may want to visit in the near future. oh yeah, I would like to clarify that this post has NOT been sponsored by any one of the above mentioned stores ~ and I have not been offered any discounts or reductions on the goods I purchased from them in lieu for this post. Thank you very much for visiting me today. Have a beautiful day and be safe. Previous postConcrete Mushrooms !! A tutorial. Masha’Allah!Master piece of information on crafts ,exquisitely written and superbly explored! Jazak Allah khair brother ! Delighted that you read my blog !! Another good craft supply shop in Ajman called Al Tebet ( a bit pricy though but you can find almost everything). Walaikum salam Manar. Thank you for the invaluable information. I havent visited Al Tebet but would love to pass by there sometime. The honorable ladies of the Ruling family in Sharjah are highly enterprising and progressive, mashallah. I understand, a Do It campaign was also organized earlier this year and we all are amazed by the fabulous Culinary Boutique in Dubai. I had been working for Al Jalila Cultural Center for children, hence this blog had been a bit neglected. Perhaps we should have a get together to share interests, ideas and love for crafts !! Do you know where i can get chain spools tho? please give me a reply if u do. Do you mean, the one for jewelry making ? Hi …very useful article…can you please tell me in carrefour , Which section is having Jute Twine….Any other shop is there from where I can get Jute Twine ? Will I be able to buy skeins of embroidery thread here? 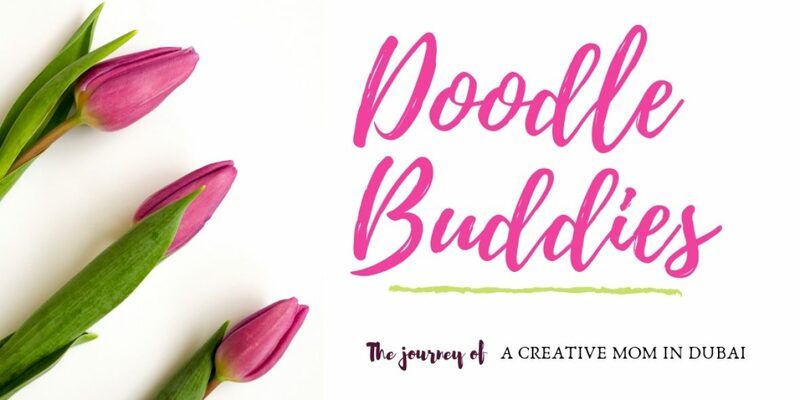 Kindly visit http://www.doodlebuddies.wordpress.com for more information. Styrofoam can be found at Creative Minds at Al Barsha. They have various sizes. I’ll definitely try some of these shops.. thanks for the info..
Hi Mila. I’m sure you’ll have a very good time at these stores. What crafts are you into ? Thank you much Naush! 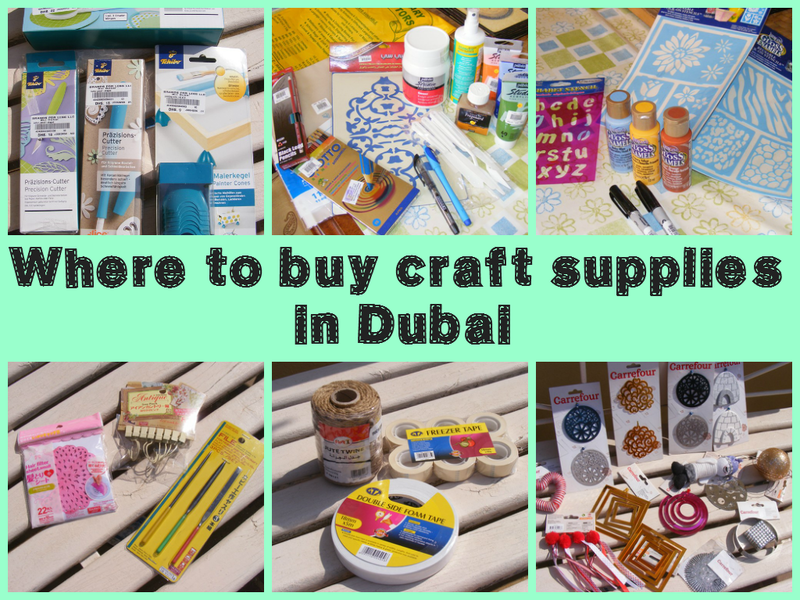 Havta say yours is the best post I’ve found bout supplies in Dubai! 🙂 And an enjoyable read. hi..Thank you for all the info. may i also add that Ace hardware in Festival city also has a very good stock of all kinds of craft and hobby items including paints and stencils etc! Also if one is looking for beads and stones then they must explore dragon mart jewellery stores! they have a wonderful collection of jewellery beads whivh of coure can be used for various other craft purposes. HI , I live close to Dragon Mart. Can you please suggest me were can i get Sealant or adhesive in Dragon Mart , as i wanted to put a water proof coating for my quilled earrings . Can You please tell me were will i get Sealants or Varnish n dragon Mart . Thanks naush for sharing the information abt crafts and ur projects I am also a craft lover and do my own crafts at home..Very good. Keep it up. Best of luck too. Where is ur studio in dubai ?? Hi Miti !! I’m glad you found this post informative. You can subscribe to my blog for all the latest posts and information. Hi Miss Naush, this post is very helpful, i want to know where i can buy in dubai a butcher shop decoration and accesoriez, thank you. Jinky, thank you for your message but what exactly is butcher shop decoration ? Please let me know and hopefully, I’ll guide you to the stores. First, thanks for this detailed article on craft items! I simply loved reading through it. Thank you for your comment Karishma. Every comment always acts as a booster in my encouragement gauge 🙂 2 areas you could try out. 1. Sharjah bank street area. 2. 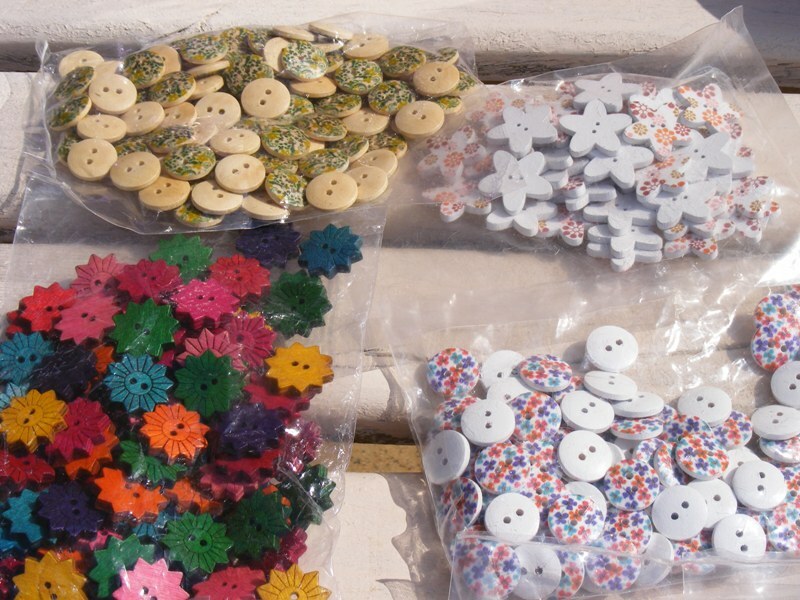 Although there is a market near ‘chapra market’ near naïf police station, that stack up scores of buttons ~ I doubt, you would get umbrella and dress shaped buttons over there. Most likely you would get scores and scores of fancy but conventional buttons. But perhaps you could give both areas, a try. i like your products i am also doing handicraft items in Kashmir India i want to sell my products in Dubai or any other part part of the world how please guide me. Mohammad Ashraf, there are several ways of doing business in Dubai. Hiiii Naush..great informations..lovely détails we feel as if we visited all this stores with u..very happy to find your post it helped me more than a lot ..so thank U and believe me the first thing I will do tomorrow is avisit to creative minds..
Hello! I love your purchases and tips. I was grinning from ear to ear reading your blog and the disclaimer “I am not a hoarder”. I am residing in Abu Dhabi and have been blogging about where to buy stuff here too, though I stopped blogging for a while after I had my second child. Good information Naush! Keep it up! Hi Leanne ! Its always such a joy to meet a reader from close to home ! I’ll be sure to pop over to your blog. That’s a very informative piece of article for newbies to Dubai. There’s one more small shop I would like to add to this list. Fida General Trading in Al Satwa. 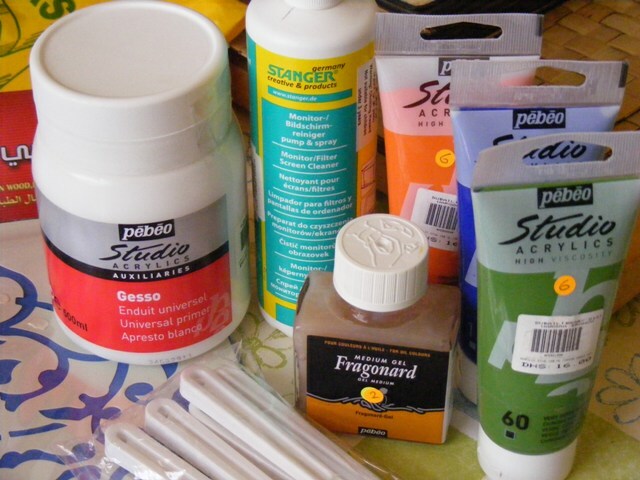 They stock lots and lots of art and craft material at very affordable rate. Thank you Sukrithaa for visiting me and this comment. Is Fida General Trading in Satwa, the one which stocks mainly haberdashery ~ its on the street of the main bus depot ? Parallel street to Ravi restaurant ?? hi! just wanted to say that there is a shop called Artistique Novelties! this is a shop full of europian home gifts but also tons and tons of craft supplies. they host workshops on monday mornings. it is located in Dubai investsment park, green community. the market (next to courtyard marriot) The shop is outside next to the lake! Thank you Yanniek. Do they have a web address ? Hello Sobia. Thank you for your message. You can buy sizzix big shot as well as Grand, in Dubai. However, it is rather expensive in Dubai. I would suggest, you ask your friend to call me at 050-4545049 and I will guide her with the details. Thanks for this , very useful 🙂 can i know if the Dubai library distributors at Murraqabat is still available ? Hello Neleisha. Thank you for your comment. Dubai Library distributors are not in Murraqabat but are located on Sala al deen street, Al Yasmeen Building. They have been there for atleast 15 years. However, closer to Muraqqabbat, behind al Ghurair center is Farook Stationery. Perhaps, you’ve got them mixed up. Best regards and happy crafting. Thank you Naush…while I will certainly pass on your number to my friend,I have just another tiny query:)…Any idea about the prize…I hv friends in US as well and as you must be aware lots of sale promotions are on there…would it be cheaper if I get it from US? Sobia, I am sure, you will love my studio. I will be glad to have you over, inshallah. Do you know where I can get knitting wool in Dubai? One of the best places for knitting wool has to be Craftland. You will be absolutely amazed at their collection and finding like minded friends there. It is located in Town Center in Jumeriah on Beach road. Please google the exact location. Thank you so much for taking the time to help others! We are two friends (pretty new to Dubai!) trying to find suppliers for our little kids party business. We would very much appreciate if you could give us some advice on where we could find party supplies (american style); ideally with wholesale prices and variety of different products. I heard that Satwa is the place to go if you are looking for good price, but don’t seem to find suppliers on the web, in that area. We have been to Creative Minds and it’s mind-blowing! Amazing stuff and so well organised, but expensive if you are looking to “resell” products to clients…. Hello Marina, I think, I may have skipped your message by-mistakenly ! Regret !! Marina, what kind of party supplies are you looking for ? I sell, party supplies too. Kindly follow me on Instagram.com/craftynaush to view the range. Also I suggest, you should check out Dragon Market for affordable party supplies. Time to time, we also receive our container shipment from china, which we then sell thru instagram. I love Creative Minds, however, they sell at typical retail prices which would leave very-little-to-no margin for you. Best regards and all the best in your creative endeavor !! Thank you for your efforts. Such a helpful thread. Do you mind helping find the last shop where you find embellishments. I am trying to do souvenirs for my soon to come baby and would love to craft them myself and looking for baby themed embellishments, ribbons etc… i tried to google the Malaysia…no results. Thank you!! Hi Mimi. Congratulations for being on the family way. The embellishments, in the end of the post are bought from Kaula Kumpur in Malaysia. Some stores in Sharjah, (behind the bank street) stock a good collection of ribbons. However, you should check out the store in Satwa. It is on the road, parallel to Ravi restaurant. Opposite the health center. His store carries a lot of beads, buttons and embellishments. can i ask you where can i find paper tape roll 12″ or 6″ ? and which area of Dubai have cheap vinyl ? I bought paper tape 4″ but it’s too small for me i need big roll of that like 12″ and i didn’t find until now in Dubai ,that’s why i asked you to maybe you know one place and i don’t know ,and i bought vinyl also but 15 dirham each ps and i need more and for me if i want buy more vinyl with this price i can’t so i asked you maybe you know where have cheap vinyl .but anyway thanks for answered . Hi Roza. Do share with us, if you do come across a store, which sells vinyl lower than dhs 15. Amtul, you can also buy relatively cheaper canvases in various sizes of at Dragon Mart, Dubai. However, unfortunately, Sharjah, is not in my expertise domain. Hey Naush !! I wanted to know where can I find vinyl, some transfer tapes, and like heat transfer materials here in Dubai? Or is it cheaper to order online like from Amazon etc..
All the best with you new venture. Nazneen, there are no flop projects, just projects you learnt something from. 🙂 Don’t give up. Hi Nazneen. 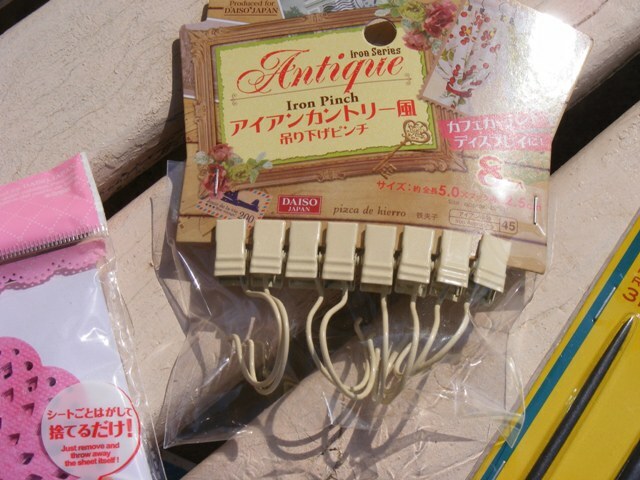 .you cud also check out Daiso. They have felt in all colors. Wide rolls or smaller 6 inch rolls in a pack of similar colors. I have never used them so I don’t know what thickness they are.you could check them out and decide depending on what thickness/quality you wud like for yr project. And I sooo agree with Naush. .There are no flop projects just projects you learn smthg from! So true! Yes Nazneen, your right. Daiso carries felt too. Do you know of a place where i can get good quality crepe paper? the stiff kind? I bought some from Day-to-day for some fringe decor but it just wilts like wet paper. Thank you for the brandsforless idea. 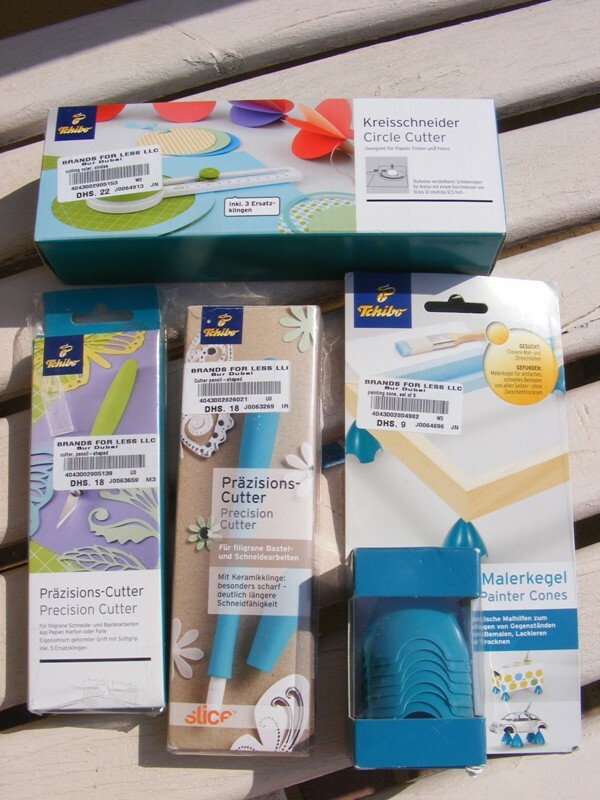 I went on their website and ordered heaps of craft stuff like the circle cutter. so excited, waiting for them in the mail! Thank you for visiting me Shaistha. I am not pleased with quality of Day to Day stuff either, but it is a convenient to pop over for emergency uses. So I totally understand what you mean by wilting of the crepe paper. However, Please be so kind as to write back, if and where you do find it, so that, others may benefit from the information. Thank you for sharing this information…been looking for some crafting materials and this helped me out a lot!Thank you!! If you dont mind me asking if you have any idea where we can find eye pins and resins? Thank you for visiting me Kitty. I’m glad you found this post useful. I think you will find resin at Craft Mind store in Al Barsha as well as the art store at Jumeriah Ladies Club. I am not very sure about about the eye pin, since, there aren’t any specific jewelry making stores in Dubai but there are a couple of haberdashery stores. Your best bet, would be to try out in sharjah, behind the bank street road, there are quite a few shalwaar suits stores, around there, there are also a couple of stores, which house haberdashery items which include some jewelry making items. If you do find them, please write back, so that, others can also benefit from your information. This post is so helpful! Thank you for taking the initiative of writing it! Would you, by any chance, happen to know where I can find shape punches in Dubai? Hello Sabika, I’m glad you found this post helpful. 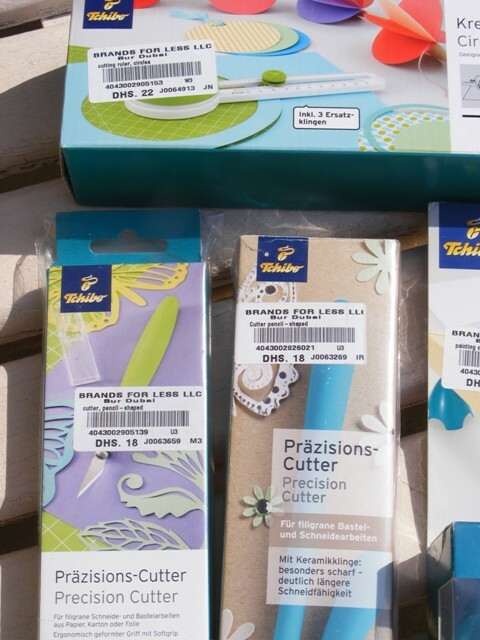 There are several places where you can find shape punches, including Creative Minds, Paper lane, and Creative hands. You can get the small size shape punches at Lulu. However, if your looking at professional projects, I would NOT recommend lulu. Alternatively, you can also have a quick look at Souq.com also. Try tchibo also.they have small & big sized punches. The shapes are limited though. Hi, great post! 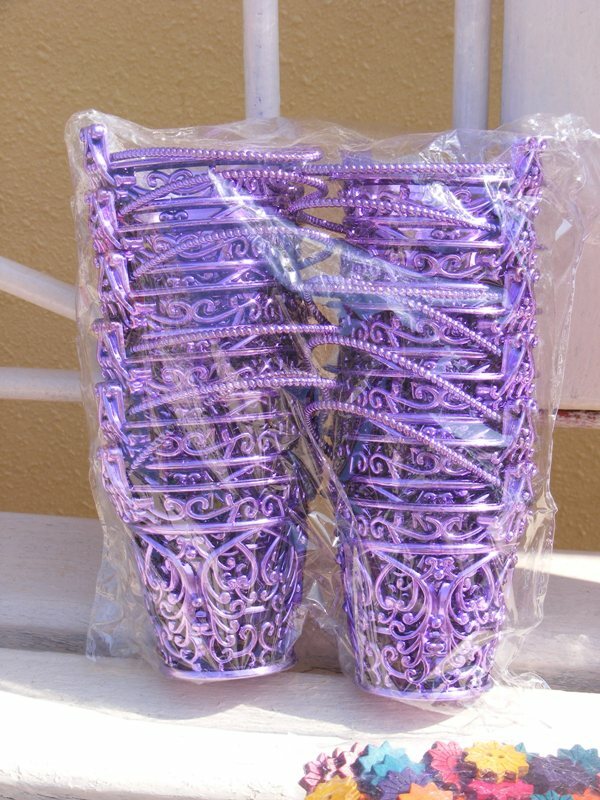 Could you tell me where you bought your items from in KL, Malaysia. Would you say it is cheaper than Dubai? Hi do u know where i can get craft rings ? Sana, I’m not sure, what you mean by craft ring ! What is its function ? Is it like the key chain link ring ? Is it the base of the ring, for jewelry making or is it a jump ring ? Please elaborate what you mean by craft ring ! I’m trying to make my own wedding invites and am searching for a place which sells some beautiful paper. Any ideas??? Congratulations Kate ! When is the big day ? How many invites are you making ? If your looking for any wedding favors or bridal shower favors, please check my facebook page :- Aspen House Gifts. For the paper, you could try :- Creative Minds, Paper lane, Creative Hands, Daiso, Creativa, Paper chase, and a couple of stores in Dragon Mart. Perhaps you should try Daiso or Dubai library distribution. I think, even if you don’t find the shape you want at these places, you can take some packaging material styro and cut it into the shape with an xo blade ~ smear some E6000 and spread the glitter on it. You might find flat styro at electronic showrooms or their warehouses. All the best. Mini, I suggest, you check with Farouq stationery and if they don’t have it, then check with any advertising or printing stores/shops. I think, Daiso might even carry glitter vinyl. Hi Naush, I can’t tell you how helpful ur post is! I do appreciate it! I wanna add to this one store I recently visited I think it’s quiet similar to Creative minds in terms of goodies and its prices, this p;ace is My Paper Lane in Jumeirah1, Town Center. I’m currently obsessed about making a scrapbook for the first time! Ladies, We should have a group to share / upload the goodies we got, our feedback , any updates, interesting projects,… this could be a wts app group or a FB group ,…. your thoughts? So happy that you found this post helpful. I love scrapbooking and my cardmaking style is deeply influenced by scrapbooking. I like Paper Lane, however, I find their prices too steep. There is yet another store, which you might want to try as well. Paper Curves in Sharjah. And an online store called Fantasy Hobbies as well. I like your idea about the group on Facebook. 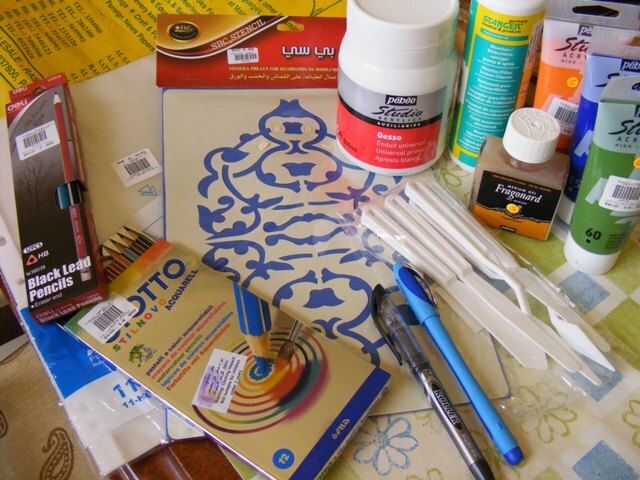 But there are several scrapbooking, cardmaking and hobbies in Dubai, groups in Dubai as well. CraftBox behind Oasis Center on Sh Zayed Road is great too. Great for bulk supplies. Assalamu’alaikum naush!! Barakallah for the amazing blog!! I have 3 kids from ages 6-2 , and as the vacation is fast approaching, i wanted to get them busy with some craft activities as they are been taught in british curriculum school. Can you please let me know where i can buy crafts for their ages group which are affordable. Walaikum salam sister Umm Muadh and Ramadhan kareem to you and your family. Thank you for your comment. It is important but difficult to keep little ones occupied in constructive activities in the vacations. We have also introduced our own kits. We realized that most of kits available in the market are boxes with items related to one particular activity. So we decided to club a large number of items and supplies, with instructions and ideas sheet, so that the little ones could use it to their own creativity and skills. Kindly whatsapp me on 050-4545049 for details of the kits. Thank you for the detailed information but I just wanted to know where transfer paper ( for tshirts ) are available. Ayanna, you can purchase transfer paper at any advertising or printers’ stores. I have not come across any stationery stores or bookshops that stock transfer paper. So kindly check your nearest printers or advertising stores. Iv been trying to find text line medium for sm time now and haven’t had any luck. I want to mix it with acrylic paints yo make fabric paints…can u suggest a place where I cud find it pls? Did u have any luck ?? Sam, several places keep Clear stamps. But they are expensive no matter where you pick them from. I’m looking for some of those round paper lanterns to hang for my wedding in white and pink. Does anybody know anywhere in Dubai that stocks these?? Hi kate. I have them. How many do you want ? I have 2 sizes as well ! Kindly whatsapp or call me on 050-4545049 for bookings. MashAllah lovely post! Just discovered this post through google 🙂 Would you have any idea where I could find gold/shiny ink pads, modge podge & small heart stamps for cheapest? Hello Insiya, Thank you for your comment and inquiry. Small heart stamps (the plastic quality one) is available at most stationery stores. The modge podge is available at Creativa at Times Square and Creative Minds. About the gold/shiny ink pads ~ not sure if you mean the Ranger series or any brand. You can get Ranger at Creative Minds and check perhaps at Creativa too. Awesome post! So helpful.. Just wondering if you would have come across a store that sells craft tissue paper. I am looking for bright colors to make pom poms. Many Thanks! i am trying to find washi tapes Or expression tapes in Dubai. Can u tell me where i can find them? Glad to have found this. Very informative and insightful. Hi Naush.. Your post is so informative for amateurs like me. I hope to see more posts from you. 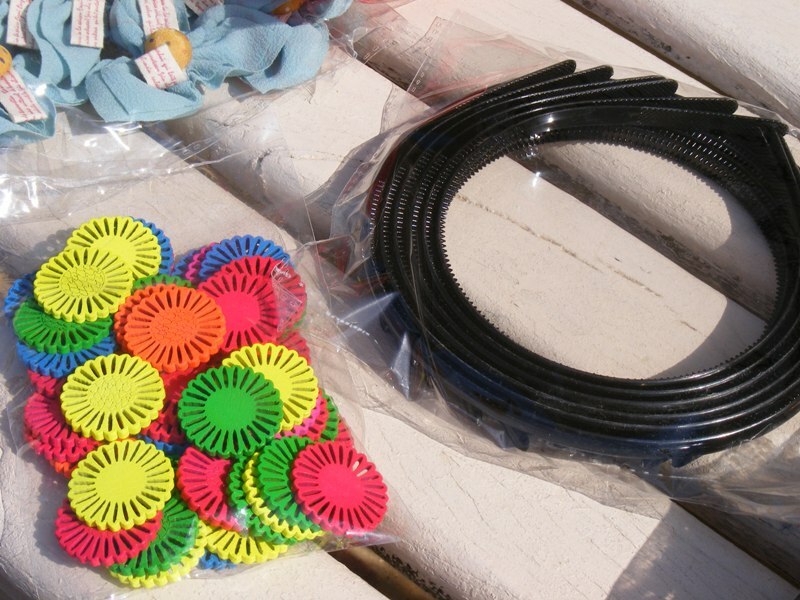 Would you know where can I get thermocol shaped as circles / rounds. I need 60 pieces of those for an event and I don’t know who can shape them in the size I need. Also Would you know how does one stick acrylic to thermocol. I understand glue damages thermocol and there is another way to stick them together and if it is a specific glue where can I find it? Ma Shaa Allah this blog post is really good. I am interested in painting, but have never painted on a canvas before. And as I am only a beginner in the very early stages of painting, I don’t want to spend much money on expensive canvases for fear of something going wrong the first time. Can you please suggest some places in Dubai or Sharjah where I can buy inexpensive canvases? I will be very grateful if you do so. 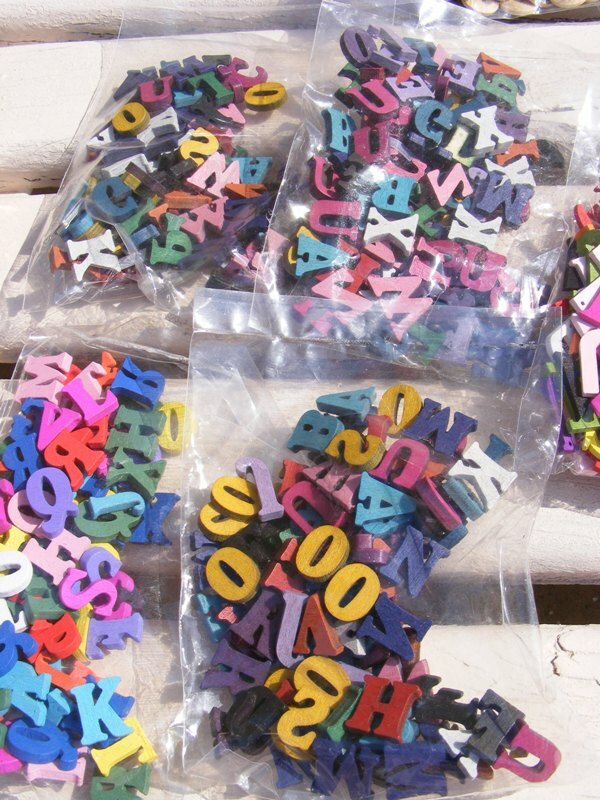 Can you please tell me from where can I buy inexpensive wooden letters (which can be spray painted) in Dubai or Sharjah? Any idea where will i get mod podge?? I just loved reading up on the information u shared. My friend is coming to Dubai and I have asked him to pick up carded wool for wet felting. Can you please tell me where I should ask him to look for it? Hi there.. Thank you for the informative post. Do you know any place where I can get felt sheets and fabrics by meter.. For making quiet books for my daughter.. Other than daiso..
Im very fond of making them.. I used to make for friends and families in my free time back in india.. I am unable to find stuff for it..
Hi…would really appreciate if you can let me know where can i get gold glitter paper to be used as a background for a photoshoot. Also i need to make the letters ONE (in huge size for the photoshoot)for my girl’s first birthday….how do i go about it? Thanks for this interesting post. Do you happen to know where i can buy a glass bottle cutter in Dubai? From where i can buy resin and spray adhesive (glue spray) in dubai ? just came across your page… its quite interesting… I have a query i hope you can help me out .. 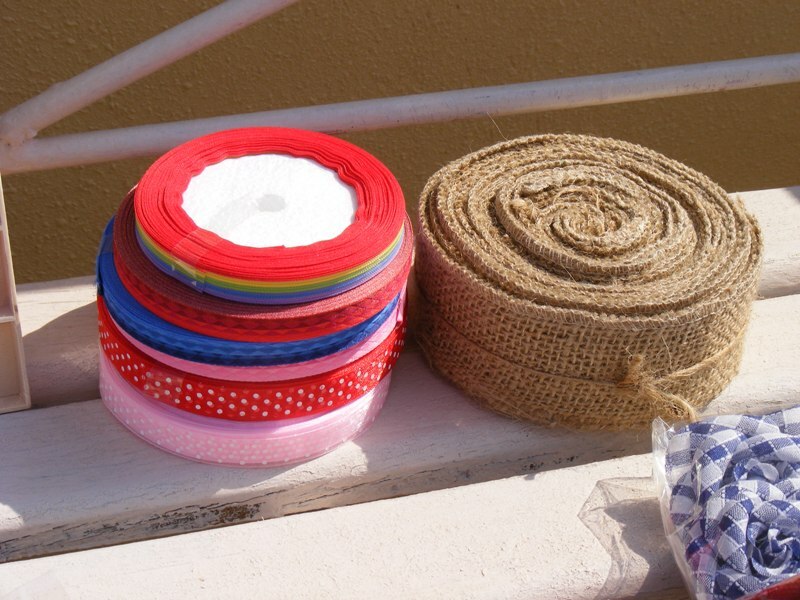 I have a small project where i have to stick Fabric (Satin & Georgette) on wood… can you please help me with what glue is best and where can i buy it in dubai? Hello Ashish. I apologize for the delay to your query. I’m sure, you’ve already attempted your project. Please do enlighten us, which glue you used and how the project turned out. Personally, Satin and wood is a difficult match – however, I feel, E6000 might do the trick. Thank you so much for this. I’ve recently taken an interest into crafting thanks to Pinterest and your blog immensely helps as most of the pinterest raw materials is available only in the US. I’m trying to make http://thefrugalgirls.com/2012/04/diy-photo-cube.html for which a Wooden Cube and Mod Podg. Can you tell me where it would be available? And the approx price of the Mod Podg. I apologize for the delay to this message. 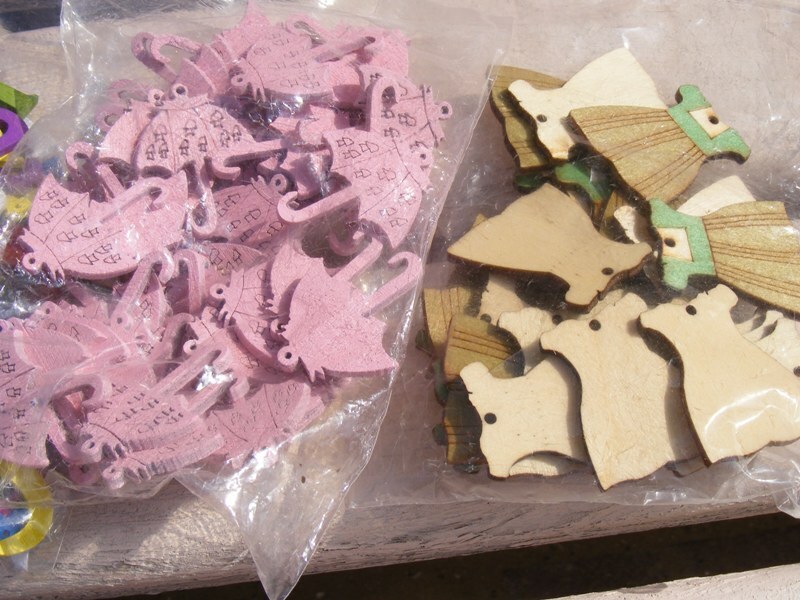 You can find Modge Podge at Creative Minds, Creative hands, Dubai library distribution and even online, like souq.com as well as papercurves.com – You might find the box at Creative minds. Please do share your creation, once completed. Thank you for this wonderful post. I recently discovered cardmaking and am searching for stores that sell cardstock/scrapbook paper at a reasonable price. This post has given me quite a few stores to try. Do you think a visit to Dragonmart would yield any results? I’m planning to visit this weekend and wondered if it might be worth looking out for supplies there? Hello Diya. Thank you or your message. I’m glad you found this blogpost helpful. I think a trip to Dragonmart will be well worth it. There are so many new stores that keep popping up there. 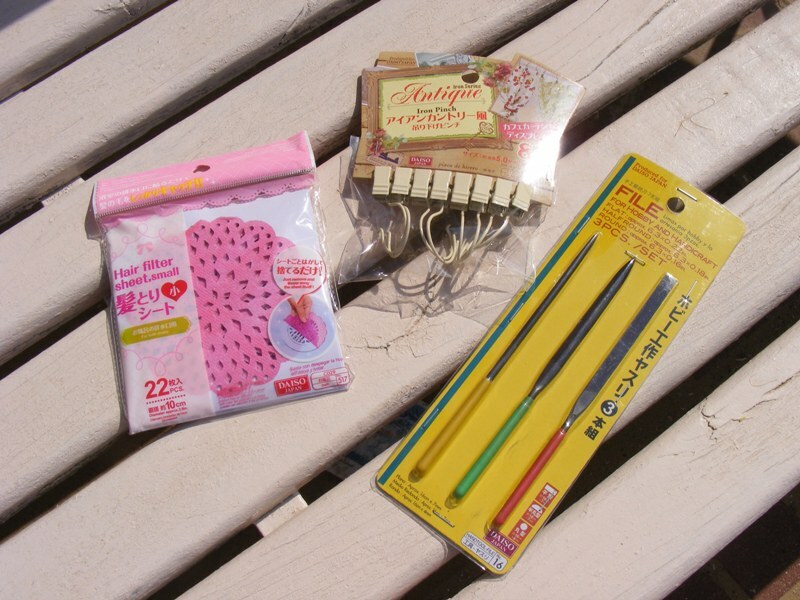 I’m sure you’ll find some treasures to use in cardmaking. All the best. Thank you so much for your reply. For future readers, I did go there and spent almost half a day there shopping for various things. There were quite a few shops with items that could be re-purposed for cardmaking like cutouts of butterflies and other shapes, beads and some fabric stores (mostly curtains but they had some lovely fabric that would look great in cards too). I didn’t find any stationery stores as such and definitely didn’t find any stores selling scrapbook paper or cardstock which was a bummer. But the place is huge and we couldn’t cover everything so possibly it might have been in a completely different area from where we were. Very informative post that will help us improve the look of our food booth at the Ripe Market! However, I’m still desperately looking for a large (~1m in height) black chalkboard where I can write our menu. I went to Dragon Mart and Creative Minds but nothing of that size. Any clue appreciated! Thanks Naush! Hi Fred. Thank you for your comment. You can also buy the Black board at Ikea. You will find it in the childrens’ section. It has a black board on one side and white board on the other. It is an ideal size for menu writing. Hope the info helps. Thank you for your comment Fred. I suggest, you have a look at Ikea. I know they have a large black board with a white board on the other side. All the best ! Hope to visit you at Ripe Market !! where can I get acrylic gel medium? I am interested in learning oil painting and as such joining some art class. Please let me know in case you are ware of any such classes. Hello Nicola. If you visit Little India in Kuala Lumpur (Malaysia), there are several bylanes within the area called ‘little India’ where you can find plenty of stores which keep stacks of buttons and embellishments from. Please ask around in Little India. Hello Yogitha. You should try HB of Dragon mart. They have atleast 3 stores where I have seen those which are quite affordable. They are towards the entrance and not in the center isle walk. Other places like Emirates Trdg, Creative Minds also have them – but they are rather expensive. Have fun with your canvas ! For sure in Dragon mart. Dear NAUSH where did i find this tools ind Dubai. Die Making Tools : Steel Rule Bender / Cutter / Notcher. Hello Wegayehu. If I have understood you rightly, you are looking for Die making tools, which could only be found in the industrial areas pf sharjah or Ajman or sourced from abroad. I’m afraid, I do not have a particular store to suggest for you. very well written, informative blog. thanks a lot for sharing the information. Thank you Susu. Reply was given on fb page. Glad to be of some help KK HAHD. It’s wonderful to come across any website every single once in a while that will isn’t the same outdated rehashed product. Great understand!